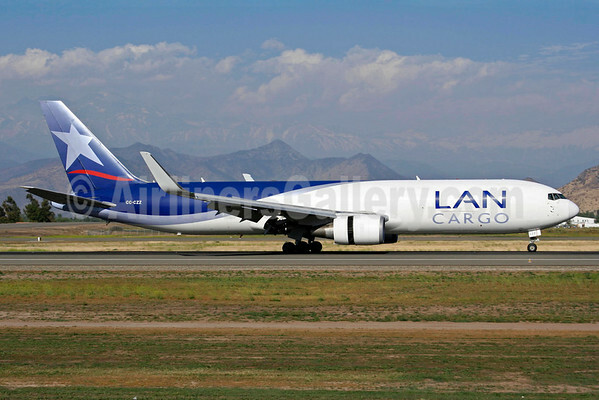 LAN Airlines (Chile) (Santiago) is leasing three Boeing 767-300F freighters to FedEx Express (Memphis) for three years. LAN currently has excess freighter capacity. Copyright Photo: Alvaro Romero/AirlinersGallery.com. Boeing 767-316F ER CC-CZZ (msn 25756) arrives at the Santiago base. This entry was posted in FedEx Express, LAN Airlines (Chile) and tagged 25756, 767, 767-300, 767-300F, 767-316F, Boeing, Boeing 767, Boeing 767-300, Boeing 767-300F, CC-CZZ, FedEx Express, LAN Airlines, LAN Airlines (Chile), Santiago, SCL on November 25, 2014 by Bruce Drum. LAN Airlines (Santiago) may be somewhat impacted by a possible strike by 70 percent of its LAN Peru (Lima) mechanics maintaining LAN and TAM aircraft. The mechanics are based in Lima, Peru. The ITF (International Transport Workers’ Federation) LATAM network reports that it is hearing of concerns from passengers due to fly on LAN and TAM planes during a strike expected to begin in Peru on June 26. Unions report that more than 200 mechanics – over 70 percent of all LAN Peru mechanics – will not be certifying airplane flights during the strike, which is expected to affect operations across Latin America, including during the World Cup. LAN Peru aviation mechanics are responsible for the security of the flights of LAN and TAM Airlines (the LATAM Airline Group), and their function is fundamental to the maintenance of the aircraft and the safety of flights. On June 26-27 a strike is likely to take place, called by the SITALANPE trade union, which represents 70 per cent of all those mechanics. This is expected to result in cancellations and delays across the region. The mechanics are unequivocal: their labor is not replaceable because they are certified to work on the aircraft. “We are the ones that review the planes each time that they land and if we do not sign the logbook of the aircraft, they do not leave. Without our approval, no plane will be able to fly and therefore the whole company will stop,” explained Juan Carlos Talavera, a LAN Peru aviation mechanic and press secretary of SITALANPE. Lima, Peru, is the central hub for maintenance work in the holding company that includes both the LAN and TAM Airlines. The Peruvian mechanics maintain the cargo and passenger aircraft for LAN Argentina, LAN Chile, LAN Ecuador, LAN Peru, and TAM and LAN Cargo. In other news, LAN Cargo (Santiago), an affiliate of LATAM Airlines Group, S.A. and part of South America’s largest airline group comprised of LAN Airlines and its affiliates and TAM Airlines, officially broke ground on a new 98,242-square-foot state of the art maintenance hangar facility at Miami International Airport. The hangar will be LATAM Airlines Group’s first maintenance hangar in the United States. The project represents an investment of more than $15 million dollars and is estimated to create more than 300 new direct and indirect jobs in the first five years, further increasing LATAM Airline Group’s participation and commitment to economic growth in Miami-Dade County and the State of Florida. The new facility includes state of the art design, technology, and meets the highest standards of environmental compliance. The innovative roof design with the tail cupola will accommodate Boeing 777-300 and Airbus A350 size aircraft, and still meet the applicable structure height requirements. This week, the aviation unions of the ITF (International Transport Workers’ Federation) Network of LATAM Unions in Chile, Argentina, Ecuador, Peru and Colombia will be taking action to support the mechanics of LAN Peru and the flight attendants of LAN Argentina. The workers will inform passengers in the airport about the actions. The passengers need to know that the demands of the LAN and TAM Airline workers are fair and that the company has the resources to resolve the conflicts. Aviation labour conditions impact the quality of life of workers and potentially the high standards of service on flights. On June 26th and 27th, a planned strike of the mechanics union (SITALANPE), who represent 70 percent of the workforce, would affect flights in the country and the region. Licensed aviation mechanics are required to certify all aircraft. In Argentina, the flight attendants have suffered time and again delays in their collective rights. Since 2005, when the company began operations in Argentina, LAN has refused to sign a collective agreement to regulate the flight attendants’ working conditions. Juan Carlos Talavera Flores, the press secretary of the SITALANPE union of Peru, has reported that he was detained on Friday, June 20th. He reports that during his detention he was threatened by a security staff from the airport. The security staff introduced himself as being sent by LAN Peru. Mr. Talavera explained that this security staff member told him that LAN Peru was going to bring a legal notary to verify his assumed illegal actions. Mr. Talvera explains that it was a confusing, frightening and strange action by LAN Peru to intervene with his detention. The leader of the mechanics union states that the police, and the security personnel of the airport sent by LAN Peru, detained him while he was distributing information to the passengers about delays and cancellations which would occur during the upcoming LAN Peru strike of June 26 and 27. At the police station, the union leader reports that he was searched unfairly for drugs and incriminatory evidence. At the jail, he was threatened. Hours later he was released without charges. Juan Carlos Talavera Flores, is a leader in the international solidarity campaign to protect aviation standards in South America. His detention was made while he was distributing information in the Jorge Chavez Airport in Lima and answering questions from passengers about the upcoming industrial actions and strikes in LAN and TAM airlines. Copyright Photo: Bruce Drum/AirlinersGallery.com. 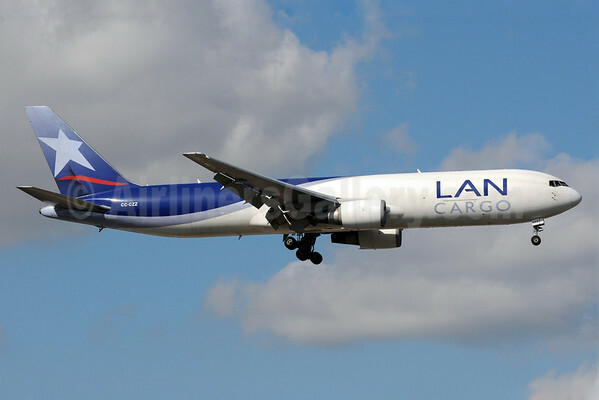 LAN Cargo’s Boeing 767-316F ER CC-CZZ (msn 25756) approaches the runway at Miami International Airport (MIA). This entry was posted in LAN Airlines, LAN Airlines (Chile), LAN Airlines (Peru), LAN Cargo, TAM Airlines, TAM Linhas Aereas and tagged 25756, 767, 767-300, 767-300F, 767-316F, Boeing, Boeing 767, Boeing 767-300, Boeing 767-300F, CC-CZZ, International Transport Workers' Federation, ITF, LAN, LAN Airlines, LAN Airlines (Chile), LAN Cargo, LAN Chile, LAN Peru, LATAM, Lima, MIA, Miami, Miami International Airport, Peru, TAM, TAM Airlines, TAM Linhas Aereas on June 21, 2014 by Bruce Drum.